The Wii Virtual Console is due to get a double dose of 8-bit adventure soon, as the ESRB has rated Sega Master System spin-off Alex Kidd in Shinobi World and NES classic Blaster Master for Nintendo's service. 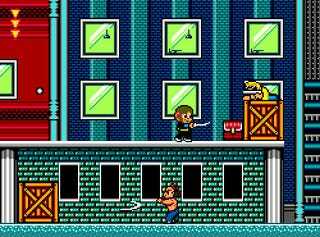 Alex Kidd in Shinobi World was, sadly, the last game in the Alex Kidd series to be released, a title that originally began its existence as Kid Shinobi before Sega opted to capitalize on its largely forgotten mascot. My favorite Alex Kidd in Shinobi World trivia morsel is the game's original first boss, Mari-Oh, a mustachioed parody of the fireball tossing Shinobi boss Ken-Oh. Sega chose not release the game with Mari-Oh in his more recognizable, legal troubling form. And, as was confirmed already by the recently revitalized Sunsoft, hybrid adventure Blaster Master is coming to the Wii's Virtual Console, as doubly confirmed by the ESRB. When? Some time in December.